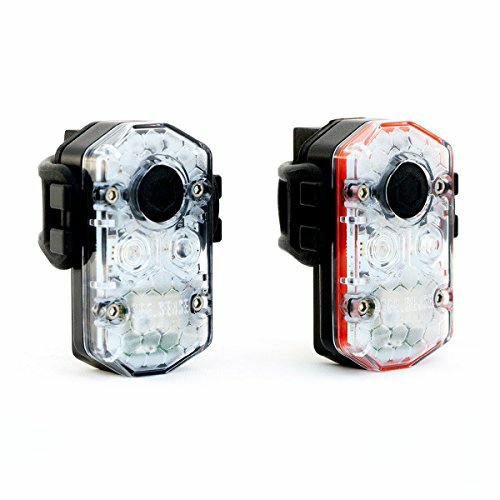 See.Sense ICON is an intelligent and connected cycle light that uses super-bright twin CREE LED's to improve your visibility, even in daylight. It reacts to your environment, flashing brighter and faster when you most need to be seen. ICON also connects to your smartphone with a free app, giving you innovative features such as crash and theft alerts and allowing you to easily change the settings. Daylight Visible - With two CREE LED's, ICON+ produces 250 lumens in the rear and 420 lumens in the f ront, making it bright enough to be seen in broad daylight. ICON+ is 30% brighter than our standard light, giving extra visibility. Intelligent Sensing - monitors the environment, changing flash patterns and brightness to keep you more visible. See.Sense is the ONLY bike light in the world that can react by flashing brighter and faster at roundabouts, road-junctions, approaching car headlights at night, travelling into shade and tunnels. Smartphone Integration - The free iOS & Android App uses Bluetooth® Smart connectivity to pair the lights with your smartphone so you can easily check battery level, change from flashing to constant, control multiple ICON's at once, customise brightness & runtime settings and receive low battery notifications. Download Firmware Over-the-Air (FOTA) updates and application updates as new features are released. Crash and Theft Alerts - if you have a crash, ICON can auto notify your nominated contact of your GPS location. Early Theft Deterrent Alarm - instantly notifies you if your bike is moved while you are not with it. Ideal for club cyclists while on a coffee stop. More - Superb runtime at over 15 Hours, recharge via USB, lightweight and compact at under 64 grams (including mount), auto on/off, secure and tool-less mounting, water sealed to IP67 standard. If you have any questions about this product by See.Sense, contact us by completing and submitting the form below. If you are looking for a specif part number, please include it with your message.